At Humana, one way we improve the health of our members is by finding our purpose together. Having a purpose in life and connecting with your local community increases well-being. 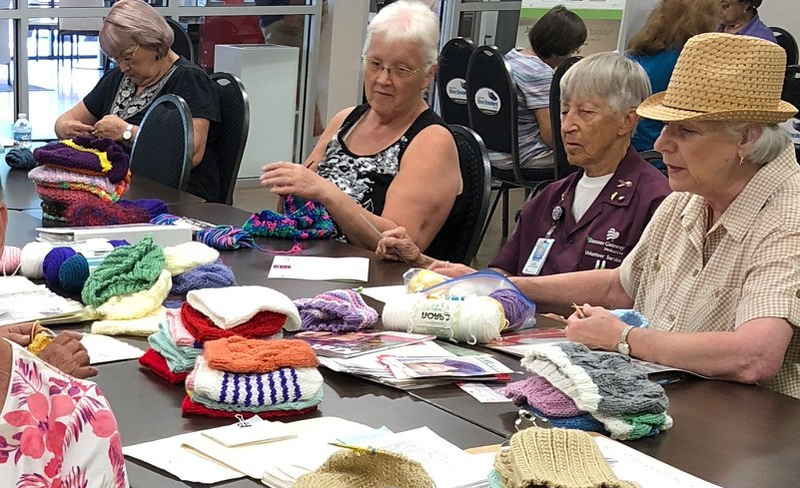 Humana Charity Crafters, a group of Humana members in Mesa, Ariz., meet twice a month to create hats and other crafts that benefit their community. By making hats for local cancer patients, the Charity Crafters connect to their sense of purpose and to each other, creating strong bonds and encouraging each other towards their best health. Humana recently released its 2016-2017 Corporate Social Responsibility (CSR) Report, detailing our efforts to be a good corporate citizen. To bring our Healthy People, Healthy Planet, Healthy Performance pillars to life, we created a series of videos highlighting our CSR work to improve health and well-being. In this video, the Humana Charity Crafters share the importance of finding their purpose, giving back to their community and connecting to each other. We want to hear from you! What’s your healthy purpose? Post on social media, tagging Humana and telling us about your healthy purpose. And, please share this video showcasing the Humana Charity Crafters. To learn more about Humana’s CSR efforts, read the 2016-2017 CSR Report.